Cakewalk Sonar X3: the Studio and Producer editions now come with Melodyne pitch correction. It's been quite a week for Cakewalk. First came the news that Gibson intends to buy the company from Roland, and now the Boston-based software developer has unveiled Sonar X3, the latest version of its DAW. 'Evolution rather than revolution' seems to be the philosophy with this update. Cakewalk has added features that are designed to improve the experience of using the core application, and partnered with third-party developers to add content to its Sonar X3 packages. As far as the different versions are concerned, there's been a subtle change in policy. Whereas before it felt as if the lower-priced Sonars were cutdown variants of the Producer edition, now the thinking is that the cheapest version, simply known as Sonar X3, should have all the core functionality of its more expensive siblings, with the Studio and Producer editions adding extra features on top. So, from the entry-level Sonar X3 upwards you get a 64-bit engine, VST 3 plugin support, Cakewalk's new comping system, and the ability to share your work via Facebook, Twitter, SoundCloud and YouTube. 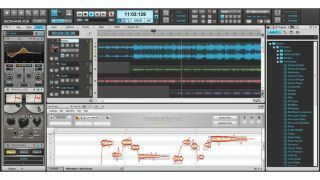 The Studio and Producer editions, meanwhile, add the likes of built-in Melodyne pitch correction, the expandable ProChannel Console Strip, and Nomad Factory plugins. Producer edition exclusives include the full version of XLN Audio Addictive Drums, the ProChannel QuadCurve EQ Zoom with analyser, the ProChannel Tape and Console Emulator, and the Lounge Lizard and Strum Acoustic instruments from AAS. You can find out more about Sonar X3 on the Cakewalk website. Prices are £79/$99/€99 for Sonar X3, £169/$199/€180 for Sonar X3 Studio and £385/$499/€380 for Sonar X3 Producer.